Shop 100% sheepskin men’s boots, genuine leather footwear, jackets and cosy knitwear and men’s accessories. From gorgeous cashmere scarfs to shield you from the wind, sheepskin gloves to keep you warm and cosy, to our classic leather goods and sheepskin footwear for outdoor adventures. Find classic winter warmers such as our 100% lambswool gloves to our sheepskin beanie and Shetland wool socks for men. Our online collection of menswear makes fantastic gifts and you can now enjoy free returns on any UK order. 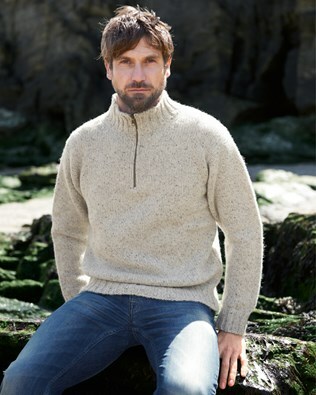 Our men’s sheepskin boots and slippers are made in Cornwall and can be tailored to your individual needs. Whether you need a pair of boots with different sizes for each foot or you require alterations to any of our menswear range, our team are here to help. We also offer a gift box service for those purchasing a present. Write a personalised message and have your gift sent directly to them in a beautifully presented special gift box. Shop our online menswear collection now. Our men’s Aqualamb boots are ideal for rainy days and come with double stitched seams and durable soles. Treated to ensure that they’re water resistant, they will help to keep your feet both warm and dry. 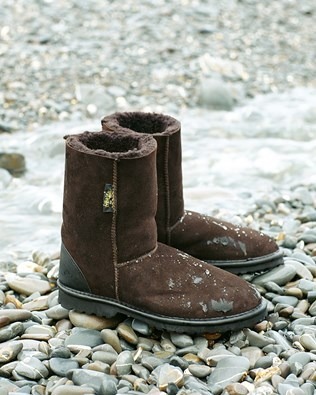 Made with 100% sheepskin, they look and feel fantastic. Our Original Celt Boot has been a firm favourite among our customers and for over 27 years. Proven to stand the test of time when it comes to style, you will not be disappointed when it comes to quality. Handcrafted and made to last, they are expertly finished with contrast leather heel protectors and hardwearing soles. 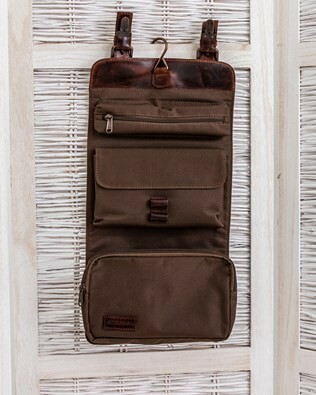 Made with 100% sheepskin, they are now available in four different colours. 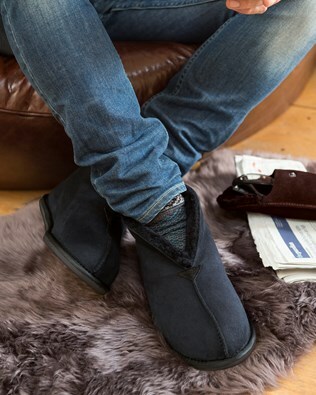 Take the comfort of sheepskin boots inside with our range of men’s slippers. Enjoy a smart yet comfortable look with our Windsor slippers. Featuring a soft suede sole and matching corded trim, they are 100% sheepskin and make a brilliant gift for him. Shop our men’s collection online now.